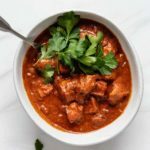 A cozy Indian curry made with marinated tofu in a creamy masala sauce! Mix all the tofu marinade ingredients together in a bowl then add the tofu and mix until coated. Cover and place in the fridge for at least 1 hour, or overnight. Scatter the tofu on the pan and bake for 30 minutes. Add the avocado oil to a large pan on medium-high heat. Add the onions, garlic and ginger and let cook on medium heat for 2-3 minutes. Next, add in all the spices and let cook for 1 minute until fragrant. Add the rest of the ingredients and mix until combined. Add the tofu and cover and let simmer on low heat for 15 minutes. This tofu tikka masala is best served up with a side of rice or naan bread!